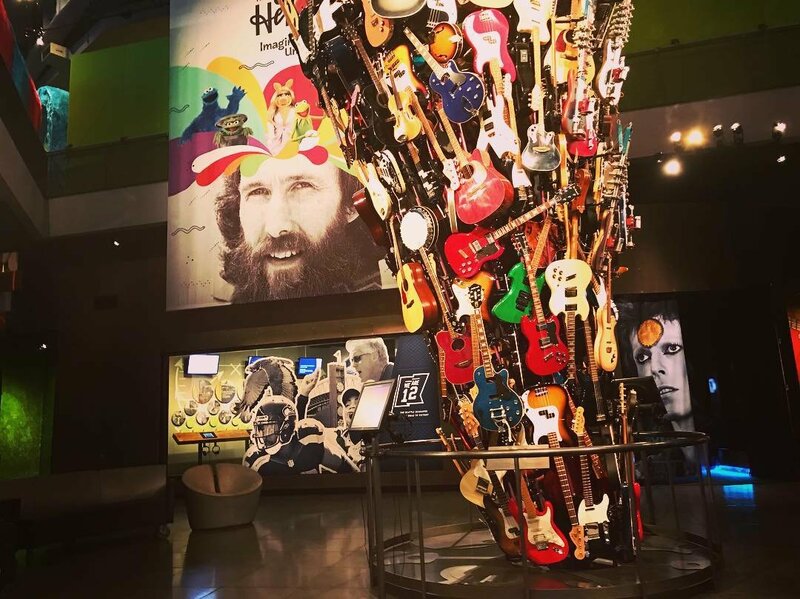 Mopop Seattle. This exhibit is a very large guitar stand, which is arguably not stable enough for touring. I’m in Seattle at the New Music Ecosystem conference, organised by the University of Washington Law School. It’s a gathering of music and law professionals, discussing the future of creators’ compensation, tech/music innovation, and copyright reform. [Grammar folks – I’ve now been in the USA for long enough, and had Oxford commas inserted into my copy so many times, that I have decided to give in and just use them from hereon]. This week I’m at the annual College Music Society conference , with Conservatory colleague Michael Shinn. We are in San Antonio, TX – my first time in the city, and in fact my first visit to Texas (I can actually see the Alamo from the hotel room!). Our first session today is a panel, chaired by David E Myers, entitled “Inclusion, Access, Relevance: Addressing 21st Century Higher Education Challenges through Shared Governance”. This is perhaps the biggest strategic conversation in US Music Higher Ed right now – the institutions know there is a problem, but many seem unable to improve student or faculty diversity in any significant way. [JB comment – I have my own theories about this, and take the view that repertoire is the primary culprit; classical music is a European tradition, and it has not absorbed non-white cultures easily. Institutions still build much of their curricula around the Common Practice period, and then express surprise that the programs are less appealing to those from other musical/cultural traditions. The question is – which lever of change is the most moveable – faculty, repertoire, curriculum or recruitment…?]. Here’s my brief interview with One Show presenter Richard Mainwaring, where we discussed the three uses of AutoTune/pitch correction. Broadcast April 2015. 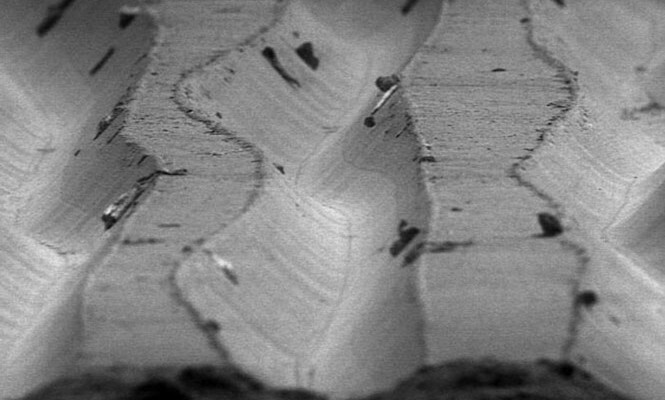 Close-up of vinyl grooves, viewed under an electron microscope. Image from the Vinyl Factory. I appeared on BBC local radio last week to discuss the ‘vinyl debate’. I’m a skeptic – in my opinion there isn’t a debate to be had, at least regarding sound quality (although I personally remember my own ‘vinyl years’ of 1980s album-buying very fondly). The fact is that vinyl sounds worse (and is sonically measurably worse) than CD or even medium-bitrate streaming audio. The arguments have been rehearsed by both sides many times – the pro lobby likes vinyl’s ‘feel’ (fair enough) and ‘warmth’ (i.e. signal distortion and low/high frequency loss). The anti lobby likes sound quality. Here’s a summary of the pro arguments, debunked with some physics and history. I was interviewed on the Graham Seaman show, discussing the history of vinyl and speculating about why people still like it despite its sonic limitations. Here’s the audio, in two parts of around 5 minutes each; it should play directly in the browser, or download part1.mp3 and part2.mp3. This article originally appeared in Total Guitar magazine issue 226, April 2012. Reproduced by permission. Words: Joe Bennett. Illustration: Naomi Hocking. Click the image to download a pdf. And after a while he gave up! If you raised a faint smile reading the paragraph above, it’s because the first line of the poem promised rhymes that never appeared. We’ve all heard hundreds of limericks, and the form requires a specific AABBA rhyme scheme, where the first, second and fifth lines rhyme with each other, and the third and fourth lines rhyme as a separate couplet. That expectation of rhyme has been hard-wired into your brain by all the limericks you’ve ever heard. A similar expectation is built into the brains of music fans through years of listening to popular songs. There are examples of successful non-rhyming songs, but these are pretty rare – almost all songs use rhyme in some way. For the songwriter, rhyming your lyrics really goes with the gig. And if you’re writing in the English language, pretty soon you run into the universal songwriter’s problem: all the best rhymes have been used. A large part of the craft of writing songs is the ability to be a problem-solver, and rhyming could be viewed as a simple word puzzle, where our task is to find the solution. Let’s say you want to convey a classic song idea such as “You’re the one I love”. There are only three ‘perfect’ rhymes available for the word ‘love’, and they are ‘glove’, ‘above’ and ‘dove’, all of which have been so heavily used by songwriters for hundreds of years that they’re near impossible to use without sounding clichéd. One solution is to choose a ‘forced’ rhyme that doesn’t quite work so well, such as rhyming ‘love’ with ‘enough’ or ‘of’. This works some of the time, but again it’s a well-known rat run for songwriters. The love/of rhyme appears in thousands of songs, such as the 1928 jazz standard I Can’t Give You Anything But Love, Baby, which rhymes the title phrase with the slightly tortuous ‘That’s the only thing I’ve plenty of, baby’. And these rhyme challenges are the same for all of us. The word ‘heart’ is the only really useful noun in English that works as a decent metaphor for ‘feeling’, ‘spirit’, ‘my emotional self’ etc. And the only useable rhymes (apart from the obvious rude one) are ‘start’, ‘art’, ‘smart’ and ‘part’, plus related two-syllable words such as ‘apart’ and ‘restart’. This limited palette is endlessly recycled by songwriters, but the Heart-shaped well shows no signs of drying up. The difficulty is that some of the rhymes can force the song into particular phrases. How many times have we heard ‘back to the start’, ‘tear us apart’ and ‘playing the part’? It’s a fine line between classic and predictable. Sooner or later – usually sooner – every songwriter runs into what I like to call a Rhyme Trap. This is where you write one line, then end up actually changing the meaning of what you’re trying to say just because you need the next line to rhyme. 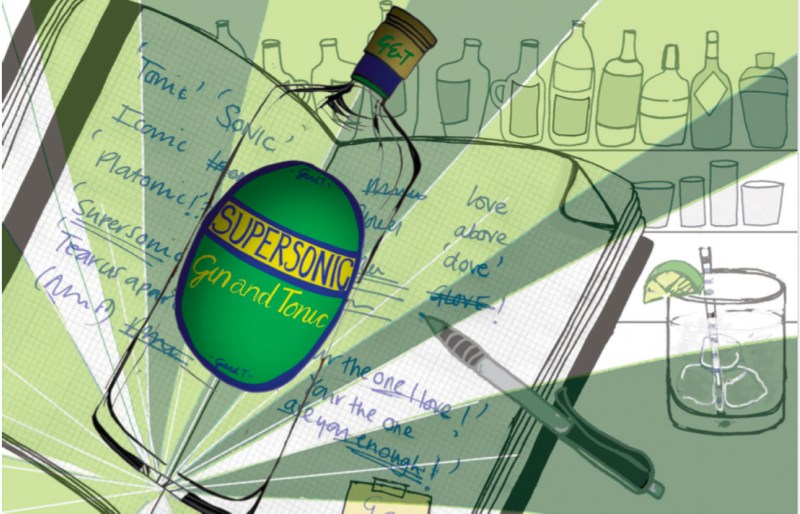 The character in Oasis’s Supersonic seems pretty macho, and perhaps isn’t the kind of guy who would drink ‘gin and tonic’, but the rhyme works, and the phrase sings well, so Noel chooses singability and rhyme over meaning. He’s a bit of a serial offender – the character in She’s Electric has a ‘cousin’. In fact she’s got about a ‘dozen’. By the third line, the verse’s AAA triple-rhyme structure has run out of perfect rhymes, forcing the ending with ‘oven’ (this is called a double assonance rhyme, poetry fans). So what’s a poor songwriter to do? Going back to our example, we could simply tweak the phrase ‘You’re the one I love’ until it reads ‘I’m in love with you’. This leaves us with the much easier problem of rhyming ‘you’. Suddenly our rhyme pallette is enormous, giving us well over 30 perfect rhymes including ‘blue’, ‘clue’, ‘do’, ‘shoe’, ‘through’, ‘to’, ‘view’ and ‘who’. Fleetwood Mac’s Big Love shows this technique in action; the song sidesteps the ‘love’ rhyme trap by putting the word in the middle of a line, so that the lyric reads ‘Looking out for love in the night so still / Oh I’ll build you a kingdom in that house on the hill’. No hands in gloves, turtle doves or skies above to be found here. So, if there’s no solution, change the problem. Or take those tricky rhymes and wobbl’em. This week I’m working with a fine group of songwriters in Scotland. We’re staying in the middle of nowhere and have nothing else to do but write and record songs for a whole week. If I can get a web connection I’ll update this blog with photos and audio from the week.